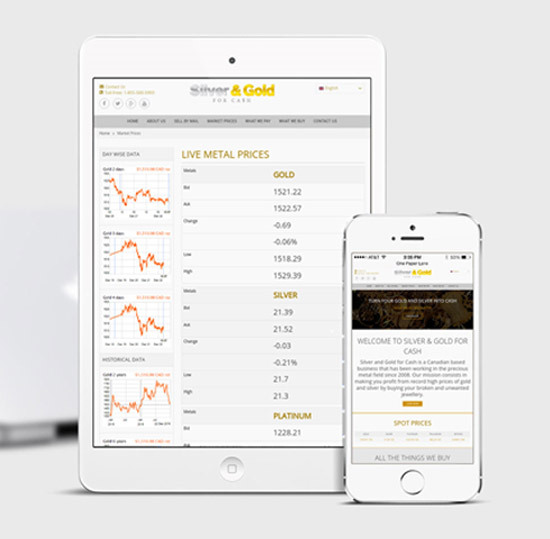 Montreal based Silver and Gold for Cash buys precious metals – gold, silver, palladium and platinum – against direct cash payments. For the owners of unusable ornaments and out-of-circulation coins, it provides the simplest way to exchange those items for money. To extend the brand’s reach, the store needed a dynamic website and approached us for the solution. The challenge was to design an engaging web portal for a service sought by discerning clientele. We had to ensure that the content clearly narrated all the options open to people who wanted to evaluate and sell their precious metal items. Team Credence chose CAKE PHP technology to develop the website for Silver and Gold for Cash. As a part of dynamic elements, we provided a custom value calculator to help users know the price of each item as per its weight and karat purity – this was successfully integrated with live market prices. For added user-friendliness market value graphs were incorporated and the website was made mobile attuned. Our creative captains were involved throughout the process to keep the aesthetics lively. In the business of buying precious metals since 2008, Silver and Gold for Cash is a recognised name for cash-connoisseurs in Montreal. The dealing is simple – it pays crisp dollars to buy unusable jewellery and other precious metal items from its clients.